We write further to the notice posted on our website on 15 April 2016. We wish to emphasise again that we did not terminate the agreement with the former partner without notice or with a maximum 48 hours' notice as alleged. The former partner terminated its agreement with us. 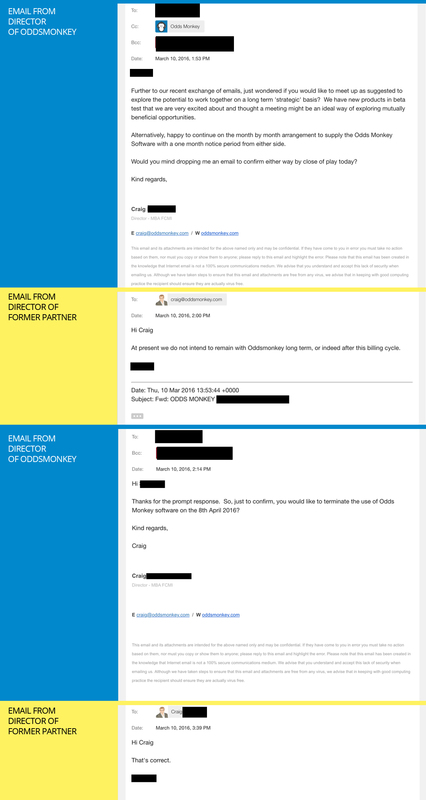 In support of our position, we have exhibited an email trail between the parties below as evidence. Following our previous notice of 15 April, our solicitor subsequently sent a letter of claim to our former partner on 19 April. We exhibit a redacted copy of that letter below. Our former partner's solicitor responded on 21 April. Our former partner has agreed to remove the statements from its forums and provide an undertaking not to unlawfully access our software while it investigates the allegations raised by us. Working with partners continues to form a core part of our business plan as we move forward. Following our recent strategic review - which included evolving our business model and partner pricing structure to bring it in line with market value - we’re delighted to continue to work with partners who recognise the value that each party contributes to the experience of the wider matched betting community. We appreciate you taking the time to read this. OddsMonkey will not be commenting further at this stage. We are aware of the allegations being raised by a former partner of our company. We wish to make it clear that our company denies all of the allegations. The former partner entered into an agreement with our company pursuant to which we provided a suite of software, including the OddsMonkey Oddsmatcher, Dutching App and Advanced Calculator. We understand that the former partner has alleged that our company terminated the agreement with 48 hours’ notice or less. That is untrue. The former partner actually gave notice to our company on the 10 March 2016 (in writing) that it wished to cancel its agreement with our company on the 8 April 2016. Since termination of the agreement, we believe that the former partner has unlawfully accessed our company’s Oddsmatcher software / data / intellectual property and used it for its own commercial gain. The matter is now being dealt with by our company’s solicitor.